Another beautiful couple, Shelina and Peter, who decided to get married and have their wedding reception in the amazing Tuscan countryside. The reception took place in the wonderful Borgo Pignano (Località Pignano, 6 – 56048 Volterra, Pisa, Italy), a well maintained and well managed historic property surrounded by the green hills of the Tuscan countryside, not so far from San Gimignano and Volterra. The whole event were held inside the property, from the ceremony until the after dinner party. During the aperitifs Guty & Simone provided a very talented harpist with whom they usually collaborate. Afterwards they also took care of the background music and the wireless microphone for the speeches during the dinner in the garden. 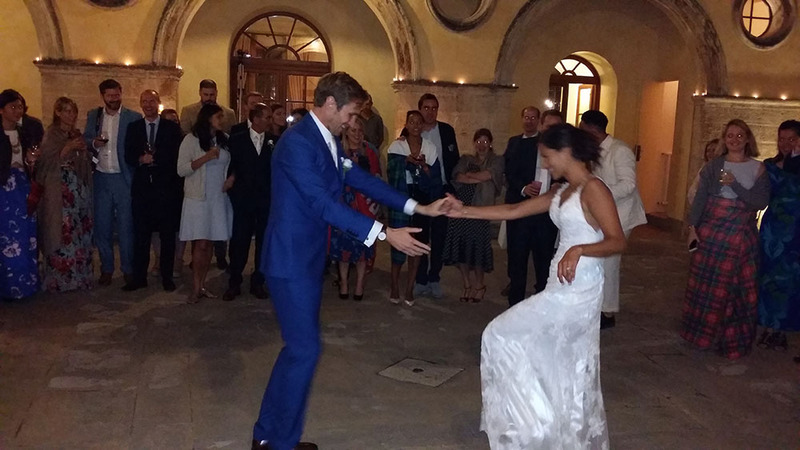 After dinner the bride and groom started the party with the first dance on the courtyard of the villa. Everybody enjoyed the party until the late evening dancing to the live music and the dj sets of Guty & Simone – Italian wedding musicians, the most esteemed and loved band for international wedding entertainments in Italy!! Borgo Pignano, Volterra, Tuscany. A wedding reception and after dinner dance party in a nice historic property very well maintained, deep in the Tuscan countryside.